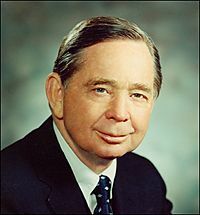 Carl Bert Albert (May 10, 1908 – February 4, 2000) was an American lawyer and a Democratic American politician from Oklahoma. He served as Speaker of the United States House of Representatives from 1971 to 1977. Carl Albert Facts for Kids. Kiddle Encyclopedia.